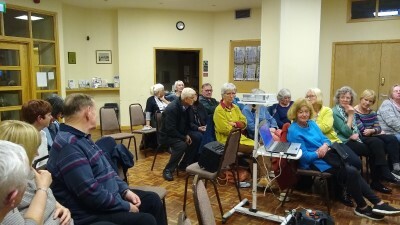 About 30 people turned out on 09 April to a film viewing sponsored by the Commission that took place at Mill Hill Chapel, City Square, in central Leeds. 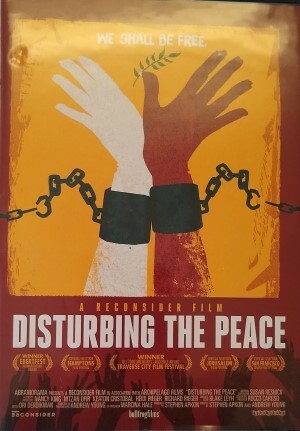 It was a film called “Disturbing the Peace” and it was an event jointly organised with the Leeds Pax Christi group. The film was introduced by Tricia Griffin who is a member of the Committee that organises the Leeds Palestinian Film Festival (which will be five years old with this year’s festival in the Autumn of 2019). This film was one of those shown during the last festival. 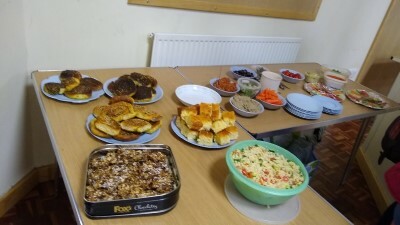 Tricia and a friend had brought along a range of Palestinian snacks – cakes, bread – and, of course, some hoummus and falafel. It provided a sociable prelude to showing the film. The film is a documentary telling the stories of some former Israeli Defence Force combatants and Palestinian fighters who come to the conclusion that the only way forward in the Israel-Palestine conflict is through nonviolent means. It is a very powerful film in many ways: the courage shown by both the Palestinian and Israelis in the film, the honesty with which they speak about their situation and how their views have changed and the difficulties that this has caused, the horror of the everyday violence that has become part of everyday life for particularly Palestinians but which has also affected a number of Israelis. What we see on the TV only scratches the surface of both the issues and how it impacts of the lives of ordinary people. This film really helps to dig down to the underlying issues of power relations and the sense of ‘other’ that are needed to maintain the current unjust situation there. People attending were visibly moved by the testimony of the people appearing, both Israeli and Palestinian. The film engendered a lively discussion afterwards. If you are interested in looking at this film or viewing it with some friends at home then please email the J&P office and an arrangement can be made. Tricia is also up for coming along to other events like this and bringing Palestinian snacks – and they are well worth having! Another DVD available for loan is “5 Broken Cameras” which is about the life of a Palestinian video journalist and is equally moving and powerful. Just send an email with 'newsletter' in the title to jandp@dioceseofleeds.org.uk Please just tell us your name and parish or organisation in the email. It will be one or two emails a month. Let's share and celebrate all the work for Justice & Peace that goes on across the Diocese - why not get others from your parish or organisation to sign up?